Saint Ephraim was a monk of the Monastery of the Annunciation on Mount Amomon in Attica, and in September of 1425 he was captured in a Turkish raid. Held captive and tormented for more than eight months, he was finally tortured to death hanging on a mulberry tree on May 5, 1426. 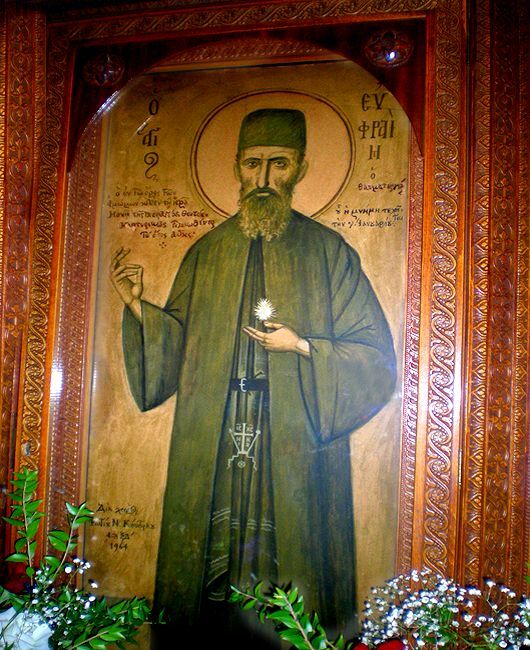 Though his story was lost to history, his relics were discovered by Mother Makaria Desypri (1911-1999) after a visitation of Saint Ephraim to her in 1950; 524 years after his death. 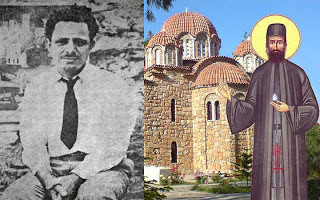 The first to paint an icon of Saint Ephraim was the renowned iconographer from Athens, Photis Kontoglou, in the year 1964. Kontoglou was born in Aivali of Asia Minor on November 8th 1895, and reposed in Athens on July 13th 1965. He was asked by Mother Makaria to paint the Saint's icon, and thus prayed to the Saint to enlighten him to depict his form. The Saint appeared to him, and Kontoglou's icon later became the inspiration for all other icons of Saint Ephraim. This icon was the last painted by Kontoglou before his repose. "That entire place is sanctified. The abbess Makaria, a venerable personality, came out and welcomed us. Her revered face radiated in her black cassock. A true and worthy bride of Christ, she shines with the joy given by the Lord to those who love Him more than parents and siblings. Her faith and prayer made the dry desert blossom like a lily. Very young and all alone she came years ago to this deserted and wild place and sat in the ruins where the jackals were nesting. She did not see people for months... Sweet and quiet Makaria pulled near her a few young nuns who dedicated themselves to her. And not only this, but in their poor nest they found shelter for other birds of God, 15 orphans, from 1 to 18 years old. Oh, rich poverty, that you shame the poor wealth of the rich!" 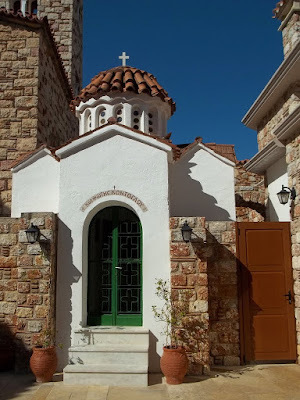 As Kontoglou lay on his deathbed in an Athens hospital, his wife Maria, during this difficult time, was on her knees praying for the miraculous healing of her husband. She was invoking the intercessions of the newly revealed Holy Great Martyr Ephraim. Because of the relationship of her dying husband with the Saint, she was hopefully expecting him to respond to her prayers for his recovery. Instead she beheld in a vision Saint Ephraim escorting the soul of her husband to God's glorious kingdom. Startled by this vision, suddenly the telephone rang. It was the hospital calling her to let her know that her husband had died peacefully. After his funeral which was presided over by the Archbishop of Athens, Kontoglou was buried at the First Cemetery of Athens. However, since it was his dying wish to be buried at the Monastery he loved so much near the Saint he loved so much, in 1978 his remains were transferred to a chapel built for his remains in the courtyard of the Monastery of the Annunciation on Mount Amomon, near his beloved Saint Ephraim.